For a nice and relatively flat run near the center of Salzburg, enjoy our ‘parks and lakes’ tour! There’s good variety in this 7 km tour. Starting at Hans Donnenberg Park & Leopoldskronstraße, do the ~2km loop around the lake, on a combination road and path. Nice water views in spots. 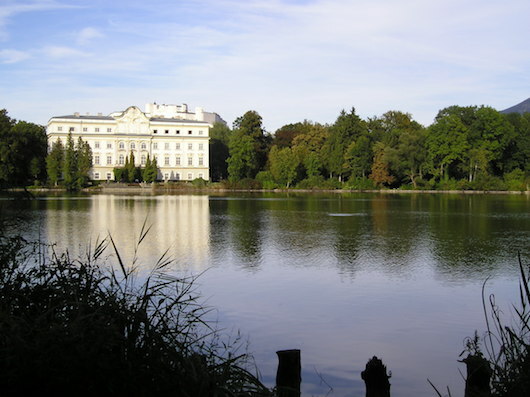 Then run through the pleasant paths of Hans Donnenberg Park, heading east toward the river, using Fürstenallee and Hofhaymer Allee, for 1.5 km, reaching the pleasant Botanical Garden. Run through the Garden, skirting the outskirts of the University of Salzburg. Then take the path going by the Schloss Freisaal (historic palace). The final 1.5 km is west along Akademiestraße and Almgasse, to the start.